One way numbers can after all make us dumber. [Used to have a more boring title still preserved in the URL. -Ed.] In general I’m deeply optimistic about the potential for dialogue between the humanities and quantitative disciplines. I think there’s a lot we can learn from each other, and I don’t think the humanities need any firewall to preserve their humanistic character. But there is one place where I’m coming to agree with people who say that quantitative methods can make us dumber. To put it simply: numbers tend to distract the eye. If you quantify part of your argument, critics (including your own internal critic) will tend to focus on problems in the numbers, and ignore the deeper problems located elsewhere. I’ve discovered this in my own practice. For instance, when I blogged about genre in large digital collections. I got a lot of useful feedback on those blog posts; it was probably the most productive conversation I’ve ever had as a scholar. But most of the feedback focused on potential problems in the quantitative dimension of my argument. E.g., how representative was this collection as a sample of print culture? Or, what smoothing strategies should I be using to plot results? My own critical energies were focused on similar questions. The biggest problem was even less quantitative, and more fundamental: I needed to think harder about the concept of genre itself. As I model different kinds of genre, and read about similar (traditional and digital) projects by other scholars, I increasingly suspect the elephant in the room is that the word may not actually hold together. Genre may be a box we’ve inherited for a whole lot of basically different things. A bibliography is a genre; so is the novel; so is science fiction; so is the Kailyard school; so is acid house. But formally, socially, and chronologically, those are entities of very different kinds. In psychology, for instance, emphasis on clearing a threshold of statistical significance (defined as a p-value) frequently distracts researchers from more fundamental questions of experimental design (like, are we attempting to measure an entity that actually exists?) Andrew Gelman persuasively suggests that this is not just a problem caused by quantification but can be more broadly conceived as a “dangerous lure of certainty.” In any field, it can be tempting to focus narrowly on the degree of certainty associated with a hypothesis. But it’s often more important to ask whether the underlying question is interesting and meaningfully framed. On the other hand, this doesn’t mean that humanists need to postpone quantitative research until we know how to define long-debated concepts. I’m now pretty skeptical about the coherence of this word genre, for instance, but it’s a skepticism I reached precisely by attempting to iron out details in a quantitative model. Questions about accuracy can prompt deeper conceptual questions, which reframe questions of accuracy, in a virtuous cycle. The important thing, I think, is not to let yourself stall out on the “accuracy” part of the cycle: it offers a tempting illusion of perfectibility, but that’s not actually our goal. Postscript: Scott Weingart conveys the point I’m trying to make in a nicely compressed way by saying that it flips the conventional worry that the mere act of quantification will produce unearned trust. In academia, the problem is more often inverse: we’re so strongly motivated to criticize numbers that we forget to be skeptical about everything else. Data mining is troubling for some of the same reasons that social science in general is troubling. It suggests that our actions are legible from a perspective we don’t immediately possess, and reveal things we haven’t consciously chosen to reveal. This asymmetry of knowledge is unsettling even when posed abstractly as a question of privacy. It becomes more concretely worrisome when power is added to the equation. Kieran Healy has written a timely blog post showing how the network analysis that allows us to better understand Boston in the 1770s could also be used as an instrument of social control. The NSA’s programs of secret surveillance are Healy’s immediate target, but it’s not difficult to imagine that corporate data mining could be used in equally troubling ways. Right now, for reasons of copyright law, humanists mostly mine data about the dead. But if we start teaching students how to do this, it’s very likely that some of them will end up working in corporations or in the government. So it’s reasonable to ask how we propose to deal with the political questions these methods raise. My own view is that we should resist the temptation to say anything reassuring, because professional expertise can’t actually resolve the underlying political problem. Any reassurance academics might offer will be deceptive. 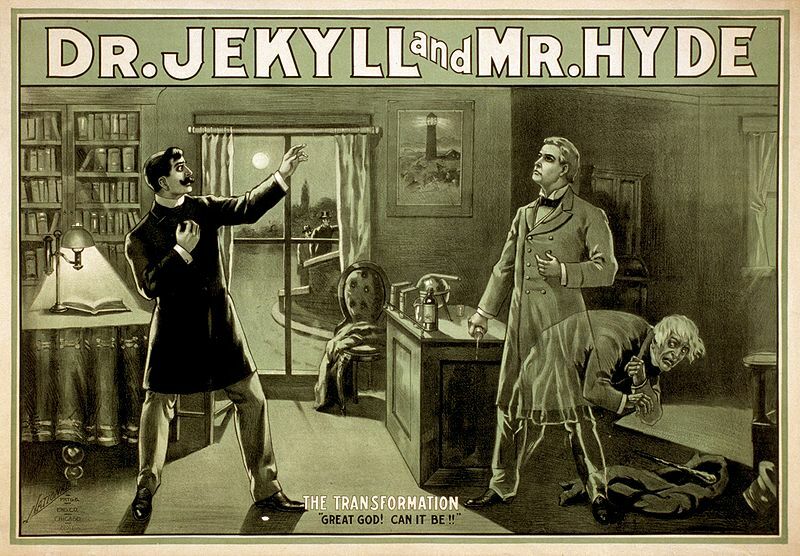 Poster from the 1880s, courtesy Wikimedia commons. Of course, something Goes Horribly Wrong. But since monster movies aren’t usually made about humanists, we may not recognize ourselves in this picture. We don’t usually “promise to use our powers for good”; we strike a different tone. I suspect some version of that statement will be very popular among humanists. It strikes a tone we’re comfortable with, and it implies that there’s an urgent need for our talents. And in fact, there’s nothing wrong with articulating a critical, humanistic perspective on data mining. It’s worth a try. But if you back up far enough — far enough that you’re standing outside the academy altogether — humanists’ claims about the restraining value of cultural critique sound a lot like “I promise only to use my powers for good.” The naive scientist says “trust me; my professional integrity will ensure that this gets used well.” The naive humanist says “trust me; my powers of skeptical critique will ensure that this gets used well.” I wouldn’t advise the public to trust either of them. I don’t have a solution to offer, either. Just about everything human beings have invented — from long pointy sticks to mathematics to cultural critique — can be used badly. It’s entirely possible that we could screw things up in a major way, and end up in an authoritarian surveillance state. Mike Konczal suggests we’re already there. I think history has some useful guidance to offer, but ultimately, “making sure we don’t screw this up” is not a problem that can be solved by any form of professional expertise. It’s a political problem — which is to say, it’s up to all of us to solve it. The case of Edward Snowden may be worth a moment’s thought here. I’m not in a position to decide whether he acted rightly. We don’t have all the facts yet, and even when we have them, it may turn out to be a nasty moral problem without clear answers. What is clear is that Snowden was grappling with exactly the kinds of political questions data mining will raise. He had to ask himself, not just whether the knowledge produced by the NSA was being abused today, but whether it was a kind of knowledge that might structurally invite abuse over a longer historical timeframe. To think that question through you have to know something about the ways societies can change; you have to imagine the perspectives of people outside your immediate environment, and you have to have some skepticism about the distorting effects of your own personal interest. These are exactly the kinds of reflection that I hope the humanities foster; they have a political value that reaches well beyond data mining in particular. But Snowden’s case is especially instructive because he’s one of the 70% of Americans who don’t have a bachelor’s degree. Wherever he learned to think this way, it wasn’t from a college course in the humanities. Instead he seems to have relied on a vernacular political tradition that told him certain questions ought to be decided by “the public,” and not delegated to professional experts. I’m not suggesting that we shouldn’t criticize abuses of statistical knowledge; on the contrary, that’s an important topic, and I expect that many good things will be written about it both by humanists and by statisticians. What I’m saying is that we shouldn’t imagine that our political responsibilities on this topic can ever be subsumed in or delegated to our professional identities. The tension between authoritarian and democratic uses of social knowledge is not a problem that can be resolved by a more chastened or enlightened methodology, or by any form of professional expertise. It requires concrete political action — which is to say, it has to be decided by all of us. Digital collections are vastly expanding literary scholars’ field of view: instead of describing a few hundred well-known novels, we can now test our claims against corpora that include tens of thousands of works. But because this expansion of scope has also raised expectations, the question of representativeness is often discussed as if it were a weakness rather than a strength of digital methods. How can we ever produce a corpus complete and balanced enough to represent print culture accurately? I think the question is wrongly posed, and I’d like to suggest an alternate frame. As I see it, the advantage of digital methods is that we never need to decide on a single model of representation. We can and should keep enlarging digital collections, to make them as inclusive as possible. But no matter how large our collections become, the logic of representation itself will always remain open to debate. For instance, men published more books than women in the eighteenth century. Would a corpus be correctly balanced if it reproduced those disproportions? Or would a better model of representation try to capture the demographic reality that there were roughly as many women as men? There’s something to be said for both views. To take another example, Scott Weingart has pointed out that there’s a basic tension in text mining between measuring “what was written” and “what was read.” A corpus that contains one record for every title, dated to its year of first publication, would tend to emphasize “what was written.” Measuring “what was read” is harder: a perfect solution would require sales figures, reviews, and other kinds of evidence. But, as a quick stab at the problem, we could certainly measure “what was printed,” by including one record for every volume in a consortium of libraries like HathiTrust. If we do that, a frequently-reprinted work like Robinson Crusoe will carry about a hundred times more weight than a novel printed only once. We’ll never create a single collection that perfectly balances all these considerations. But fortunately, we don’t need to: there’s nothing to prevent us from framing our inquiry instead as a comparative exploration of many different corpora balanced in different ways. For instance, if we’re troubled by the difference between “what was written” and “what was read,” we can simply create two different collections — one limited to first editions, the other including reprints and duplicate copies. Neither collection is going to be a perfect mirror of print culture. Counting the volumes of a novel preserved in libraries is not the same thing as counting the number of its readers. But comparing these collections should nevertheless tell us whether the issue of popularity makes much difference for a given research question. I suspect in many cases we’ll find that it makes little difference. 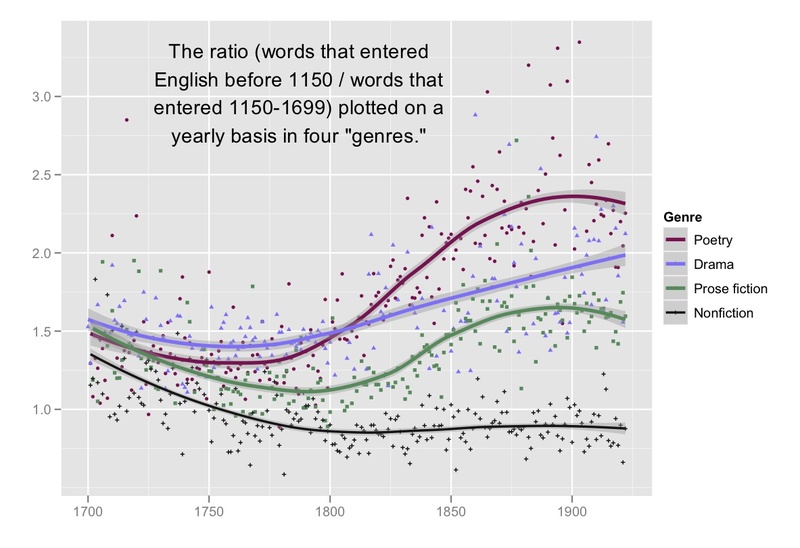 For instance, in tracing the development of literary language, I got interested in the relative prominence of words that entered English before and after the Norman Conquest — and more specifically, in how that ratio changed over time in different genres. My first approach to this problem was based on a collection of 4,275 volumes that were, for the most part, limited to first editions (773 of these were prose fiction). The same question posed to two different collections. 773 hand-selected first editions on the left; on the right, 47,549 volumes, including many translations and reprints. Yearly ratios are plotted rather than individual works. It made almost no difference. The scatterplots look different, of course, because the hand-selected collection (on the left) is relatively stable in size across the timespan, and has a consistent kind of noisiness, whereas the HathiTrust collection (on the right) gets so huge in the nineteenth century that noise almost disappears. But the trend lines are broadly comparable, although the collections were created in completely different ways and rely on incompatible theories of representation. I don’t regret the year I spent getting a binocular perspective on this question. Although in this case changing the corpus made little difference to the result, I’m sure there are other questions where it will make a difference. And we’ll want to consider as many different models of representation as we can. I’ve been gathering metadata about gender, for instance, so that I can ask what difference gender makes to a given question; I’d also like to have metadata about the ethnicity and national origin of authors. But the broader point I want to make here is that people pursuing digital research don’t need to agree on a theory of representation in order to cooperate. If you’re designing a shared syllabus or co-editing an anthology, I suppose you do need to agree in advance about the kind of representativeness you’re aiming to produce. Space is limited; tradeoffs have to be made; you can only select one set of works. But in digital research, there’s no reason why we should ever have to make up our minds about a model of representativeness, let alone reach consensus. The number of works we can select for discussion is not limited. So we don’t need to imagine that we’re seeking a correspondence between the reality of the past and any set of works. Instead, we can look at the past from many different angles and ask how it’s transformed by different perspectives. We can look at all the digitized volumes we have — and then at a subset of works that were widely reprinted — and then at another subset of works published in India — and then at three or four works selected as case studies for close reading. These different approaches will produce different pictures of the past, to be sure. But nothing compels us to make a final choice among them. Uneasiness with mere word-counting remains strong even in researchers familiar with statistical methods, and makes us search restlessly for something better than “words” on which to apply them. Maybe if we stemmed words to make them more like concepts? Or parsed sentences? In my case, this impulse made me spend a lot of time mining two- and three-word phrases. Nothing wrong with any of that. These are all good ideas, but they may not be quite as essential as we imagine. I suspect the core problem is that most of us learned language a long time ago, and have forgotten how much leverage it provides. We can still recognize that syntax might be worthy of analysis — because it’s elusive enough to be interesting. But the basic phenomenon of the “word” seems embarrassingly crude. Baby, 1949, from the Galt Museum, on Creative Commons. Natural language processing is going to be important for all kinds of reasons — among them, it can eventually tell us which clauses are subjunctive (should we wish to know). But I think it’s a mistake to imagine that text mining is now in a sort of crude infancy, whose real possibilities will only be revealed after NLP matures. Wordcounts are amazing! An enormous amount of our cultural history is already tagged, in a detailed way that is also easy to analyze statistically. That’s not an embarrassingly babyish method: it’s a huge and obvious research opportunity. This post is substantially the same as a talk I delivered at the University of Nebraska on Friday, Feb 8th. In recent months I’ve had several conversations with colleagues who are friendly to digital methods but wary of claims about novelty that seem overstated. They believe that text mining can add a new level of precision to our accounts of literary history, or add a new twist to an existing debate. They just don’t think it’s plausible that quantification will uncover fundamentally new evidence, or patterns we didn’t previously expect. If I understand my friends’ skepticism correctly, it’s founded less on a narrow objection to text mining than on a basic premise about the nature of literary study. And where the history of the discipline is concerned, they’re arguably right. In fact, the discipline of literary studies has not usually advanced by uncovering unexpected evidence. As grad students, that’s not what we were taught to aim for. Instead we learned that the discipline moves forward dialectically. You take something that people already believe and “push against” it, or “critique” it, or “complicate” it. You don’t make discoveries in literary study, or if you do they’re likely to be minor — a lost letter from Byron to his tailor. Instead of making discoveries, you make interventions — a telling word. The broad contours of our discipline are already known, so nothing can grow without displacing something else. So much flows from this assumption. If we’re not aiming for discovery, if the broad contours of literary history are already known, then methodological conversation can only be a zero-sum game. That’s why, when I say “digital methods don’t have to displace traditional scholarship,” my colleagues nod politely but assume it’s insincere happy talk. They know that in reality, the broad contours of our discipline are already known, and anything within those boundaries can only grow by displacing something else. These are the assumptions I was also working with until about three years ago. But a couple of years of mucking about in digital archives have convinced me that the broad contours of literary history are not in fact well understood. For instance, I just taught a course called Introduction to Fiction, and as part of that course I talk about the importance of point of view. You can characterize point of view in a lot of subtle ways, but the initial, basic division is between first-person and third-person perspectives. Suppose some student had asked the obvious question, “Which point of view is more common? Is fiction mostly written in the first or third person? And how long has it been that way?” Fortunately undergrads don’t ask questions like that, because I couldn’t have answered. I have a suspicion that first person is now used more often in literary fiction than in novels for a mass market, but if you ask me to defend that — I can’t. If you ask me how long it’s been that way — no clue. I’ve got a Ph.D in this field, but I don’t know the history of a basic formal device. Now, I’m not totally ignorant. I can say what everyone else says: “Jane Austen perfected free indirect discourse. Henry James. Focalizing character. James Joyce. Stream of consciousness. Etc.” And three years ago that might have seemed enough, because the bigger, simpler question was obviously unanswerable and I wouldn’t have bothered to pose it. But recently I’ve realized that this question is answerable. We’ve got large digital archives, so we could in principle figure out how the proportions of first- and third-person narration have changed over time. 1) Our digital collections are incomplete. I’m working with a collection of about 700,000 18th and 19th-century volumes drawn from HathiTrust. That’s a lot. But it’s not everything that was written in the English language, or even everything that was published. The truth is that the first person comes in a lot of different forms. There are cases where the narrator is also the protagonist. That’s pretty straightforward. Then epistolary novels. Then there are cases where the narrator is anonymous — and not a participant in the action — but sometimes refers to herself as I. Even Jane Austen’s narrator sometimes says “I.” Henry Fielding’s narrator does it a lot more. Should we simply say this is third-person narration, or should we count it as a move in the direction of first? Then, what are we going to do about books like Bleak House? Alternating chapters of first and third person. Maybe we call that 50% first person? — or do we assign it to a separate category altogether? What about a novel like Dracula, where journals and letters are interspersed with news clippings? Suppose we tried to crowdsource this problem. We get a big team together and decide to go through half a million volumes, first of all to identify the ones that are fiction, and secondly, if a volume is fiction, to categorize the point of view. Clearly, it’s going to be hard to come to agreement on categories. We might get halfway through the crowdsourcing process, discover a new category, and have to go back to the drawing board. Notice that I haven’t mentioned computers at all yet. This is not a problem created by computers, because they “only understand binary logic.” It’s a problem created by us. Distant reading is hard, fundamentally, because human beings don’t agree on a shared set of categories. Franco Moretti has a well-known list of genres, for instance, in Graphs, Maps, Trees. But that list doesn’t represent an achieved consensus. Moretti separates the eighteenth-century gothic novel from the late-nineteenth-century “imperial gothic.” But for other critics, those are two parts of the same genre. For yet other critics, the “gothic” isn’t a genre at all; it’s a mode like tragedy or satire, which is why gothic elements can pervade a bunch of different genres. This is the darkest moment of this post. It may seem that there’s no hope for literary historians. How can we ever know anything if we can’t even agree on the definitions of basic concepts like genre and point of view? But here’s the crucial twist — and the real center of what I want to say. 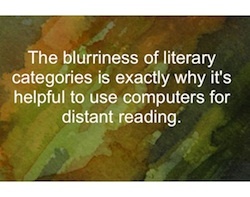 The blurriness of literary categories is exactly why it’s helpful to use computers for distant reading. With an algorithm, we can classify 500,000 volumes provisionally. Try defining point of view one way, and see what you get. If someone else disagrees, change the definition; you can run the algorithm again overnight. You can’t re-run a crowdsourced cataloguing project on 500,000 volumes overnight. Second, algorithms make it easier to treat categories as plural and continuous. Although Star Trek teaches us otherwise, computers do not start to stammer and emit smoke if you tell them that an object belongs in two different categories at once. Instead of sorting texts into category A or category B, we can assign degrees of membership to multiple categories. As many as we want. So The Moonstone can be 80% similar to a sensation novel and 50% similar to an imperial gothic, and it’s not a problem. Of course critics are still going to disagree about individual cases. And we don’t have to pretend that these estimates are precise characterizations of The Moonstone. The point is that an algorithm can give us a starting point for discussion, by rapidly mapping a large collection in a consistent but flexibly continuous way. Then we can ask, Does the gothic often overlap with the sensation novel? What other genres does it overlap with? Even if the boundaries are blurry, and critics disagree about every individual case — even if we don’t have a perfect definition of the term “genre” itself — we’ve now got a map, and we can start talking about the relations between regions of the map. Can we actually do this? Can we use computers to map things like genre and point of view? Yes, to coin a phrase, we can. 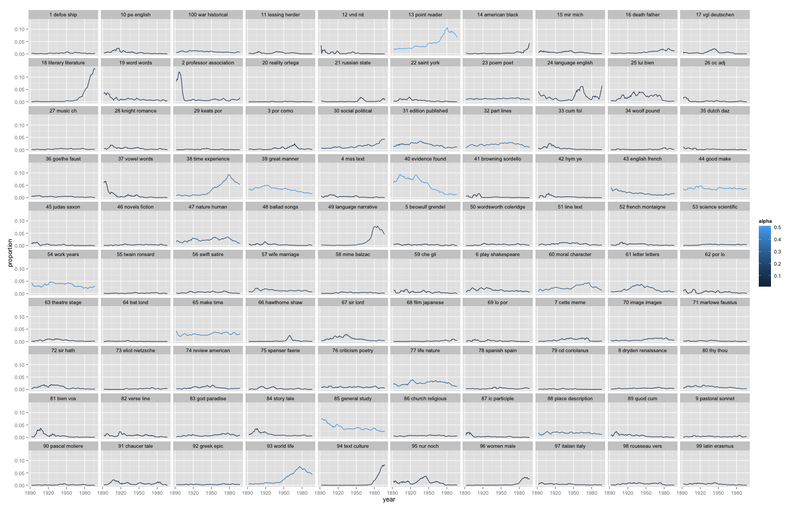 The truth is that you can learn a lot about a document just by looking at word frequency. That’s how search engines work, that’s how spam gets filtered out of your e-mail; it’s a well-developed technology. The Stanford Literary Lab suggested a couple of years ago that it would probably work for literary genres as well (see Pamphlet 1), and Matt Jockers has more detailed work forthcoming on genre and diction in Macroanalysis. There are basically three steps to the process. First, get a training set of a thousand or so examples and tag the categories you want to recognize: poetry or prose, fiction or nonfiction, first- or third-person narration. Then, identify features (usually words) that turn out to provide useful clues about those categories. There are a lot of ways of doing this automatically. Personally, I use a Wilcoxon test to identify words that are consistently common or uncommon in one class relative to others. Finally, train classifiers using those features. I use what’s known as an “ensemble” strategy where you train multiple classifiers and they all contribute to the final result. Each of the classifiers individually uses an algorithm called “naive Bayes,” which I’m not going to explain in detail here; let’s just say that collectively, as a group, they’re a little less “naive” than they are individually — because they’re each relying on slightly different sets of clues. How accurate does this end up being? This confusion matrix gives you a sense. Let me underline that this is work in progress. If I were presenting finished results I would need to run this multiple times and give you an average value. But these are typical results. Here I’ve got a corpus of thirteen hundred nineteenth-century volumes. I train a set of classifiers on two-thirds of the corpus, and then test it by using it to classify the other third of the corpus which it hasn’t yet seen. That’s what I mean by saying 432 documents were “held out.” To make the accuracy calculations simple here, I’ve treated these categories as if they were exclusive, but in the long run, we don’t have to do that: documents can belong to more than one at once. These results are pretty good, but that’s partly because this test corpus didn’t have a lot of miscellaneous collected works in it. In reality you see a lot of volumes that are a mosaic of different genres — the collected poems and plays of so-and-so, prefaced by a prose life of the author, with an index at the back. Obviously if you try to classify that volume as a single unit, it’s going to be a muddle. But I think it’s not going to be hard to use genre classification itself to segment volumes, so that you get the introduction, and the plays, and the lyric poetry sorted out as separate documents. I haven’t done that yet, but it’s the next thing on my agenda. One complication I have already handled is historical change. Following up a hint from Michael Witmore, I’ve found that it’s useful to train different classifiers for different historical periods. Then when you get an uncategorized document, you can have each classifier make a prediction, and weight those predictions based on the date of the document. So what have I found? 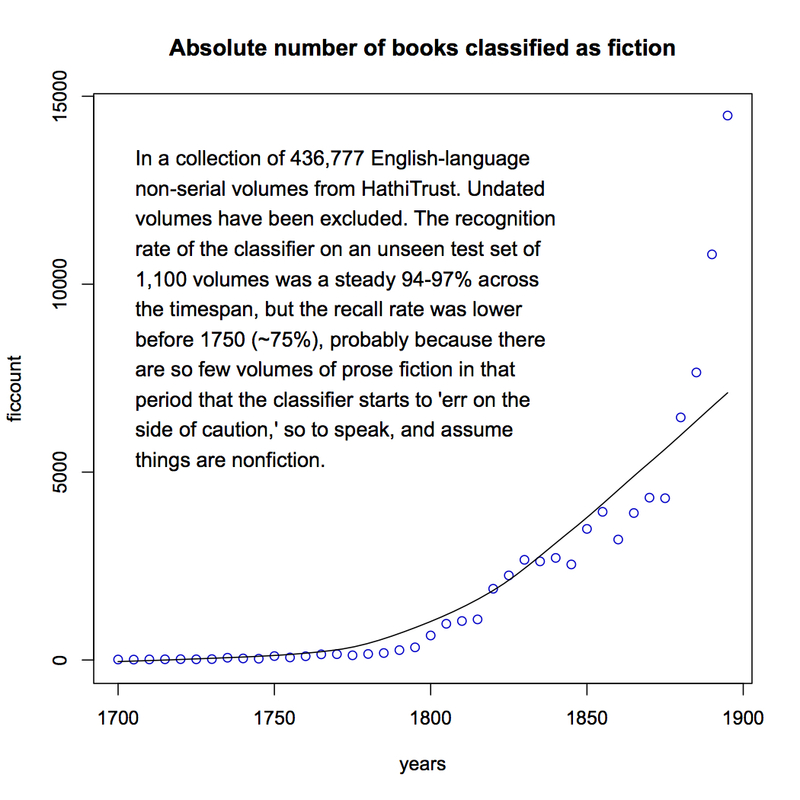 First of all, here’s the absolute number of volumes I was able to identify as fiction in HathiTrust’s collection of eighteenth and nineteenth-century English-language books. Instead of plotting individual years, I’ve plotted five-year segments of the timeline. The increase, of course, is partly just an absolute increase in the number of books published. Features consistently more common in first- or third-person narration, ranked by Mann-Whitney-Wilcoxon rho. What about the question we started with — first-person narration? I approach this the same way I approached genre classification. 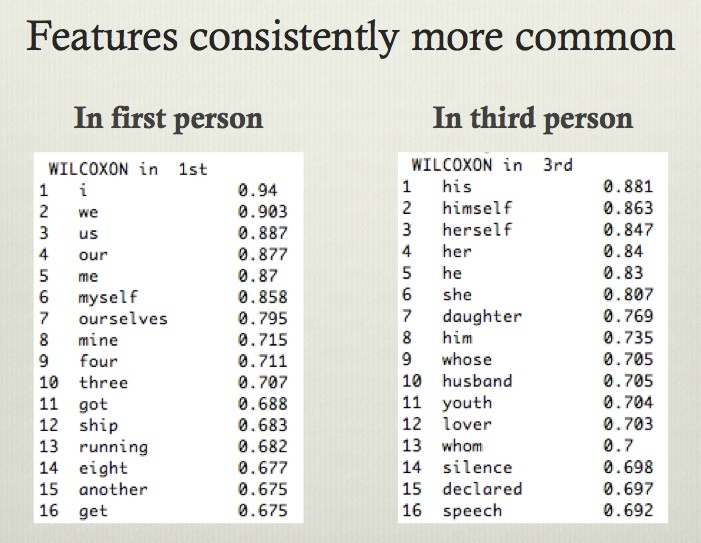 I trained a classifier on 290 texts that were clearly dominated by first- or third-person narration, and used a Wilcoxon test to select features that are consistently more common in one set or in the other. Now, it might seem obvious what these features are going to be: obviously, we would expect first-person and third-person pronouns to be the most important signal. But I’m allowing the classifier to include whatever features it in practice finds. For instance, terms for domestic relationships like “daughter” and “husband” and the relative pronouns “whose” and “whom” are also consistently more common in third-person contexts, and oddly, numbers seem more common in first-person contexts. I don’t know why that is yet; this is work in progress and there’s more exploration to do. But for right now I haven’t second-guessed the classifier; I’ve used the top sixteen features in both lists whether they “make sense” or not. And this is what I get. 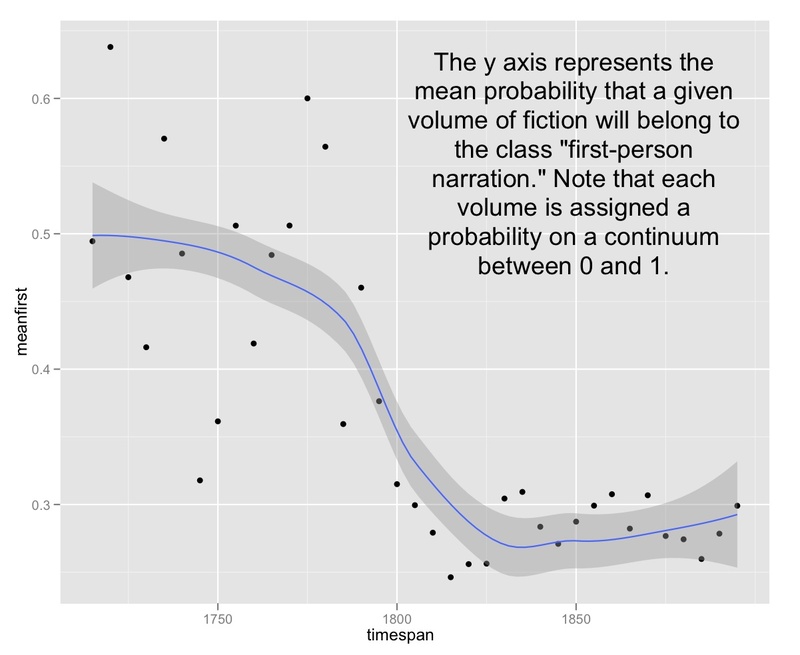 The classifier predicts each volume’s probability of belonging to the class “first person.” That can be anywhere between 0 and 1, and it’s often in the middle (Bleak House, for instance, is 0.54). I’ve averaged those values for each five-year interval. I’ve also dropped the first twenty years of the eighteenth century, because the sample size was so low there that I’m not confident it’s meaningful. Now, there’s a lot more variation in the eighteenth century than in the nineteenth century, partly because the sample size is smaller. But even with that variation it’s clear that there’s significantly more first-person narration in the eighteenth century. 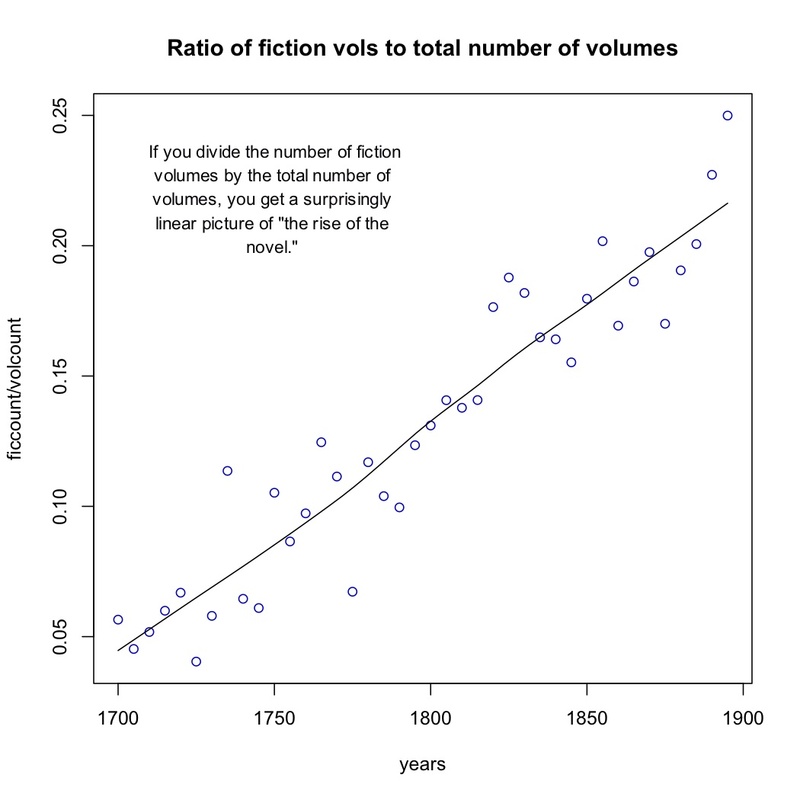 About half of eighteenth-century fiction is first-person, and in the nineteenth century that drops down to about a quarter. That’s not something I anticipated. I expected that there might be a gradual decline in the amount of first-person narration, but I didn’t expect this clear and relatively sudden moment of transition. Obviously when you see something you don’t expect, the first question you ask is, could something be wrong with the data? But I can’t see a source of error here. I’ve cleaned up most of the predictable OCR errors in the corpus, and there aren’t more medial s’s in one list than in the other anyway. And perhaps this picture is after all consistent with our expectations. Eleanor Courtemanche points out that the timing of the shift to third person is consistent with Ian Watt’s account of the development of omniscience (as exemplified, for instance, in Austen). In a quick twitter poll I carried out before announcing the result, Jonathan Hope did predict that there would be a shift from first-person to third-person dominance, though he expected it to be more gradual. Amanda French may have gotten the story up to 1810 exactly right, although she expected first-person to recover in the nineteenth century. I expected a gradual decline of first-person to around 1810, and then a gradual recovery — so I seem to have been completely wrong. 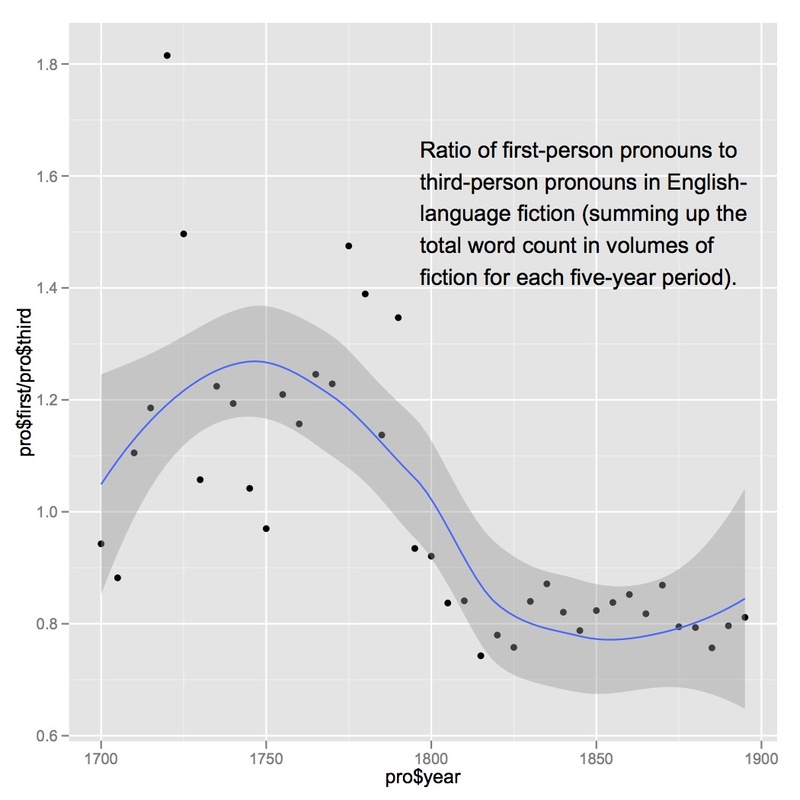 The ratio between raw counts of first- and third-person pronouns in fiction. Much more could be said about this result. You could decide that I’m wrong to let my classifier use things like numbers and relative pronouns as clues about point of view; we could restrict it just to counting personal pronouns. (That won’t change the result very significantly, as you can see in the illustration on the right — which also, incidentally, shows what happens in those first twenty years of the eighteenth century.) But we could refine the method in many other ways. We could exclude pronouns in direct discourse. We could break out epistolary narratives as a separate category. All of these things should be tried. I’m explicitly not claiming to have solved this problem yet. Remember, the thesis of this talk is that we don’t understand literary history. In fact, I think the point of posing these questions on a large scale is partly to discover how slippery they are. I realize that to many people that will seem like a reason not to project literary categories onto a macroscopic scale. It’s going to be a mess, so — just don’t go there. But I think the mess is the reason to go there. The point is not that computers are going to give us perfect knowledge, but that we’ll discover how much we don’t know. For instance, I haven’t figured out yet why numbers are common in first-person narrative, but I suspect it might be because there’s a persistent affinity with travel literature. As we follow up leads like that we may discover that we don’t understand point of view itself as well as we assume. It’s this kind of complexity that will ultimately make classification interesting. It’s not just about sorting things into categories, but about identifying the places where a category breaks down or has changed over time. I would draw an analogy here to a paper on “Gender in Twitter” recently published by a group of linguists. They used machine learning to show that there are not two but many styles of gender performance on Twitter. I think we’ll discover something similar as we explore categories like point of view and genre. We may start out trying to recognize known categories, like first-person narration. But when you sort a large collection into categories, the collection eventually pushes back on your categories as much as the categories illuminate the collection. Acknowledgments: This research was supported by the Andrew W. Mellon Foundation through “Expanding SEASR Services” and “The Uses of Scale in Literary Study.” Loretta Auvil, Mike Black, and Boris Capitanu helped develop resources for normalizing 18/19c OCR, many of which are public at usesofscale.com. Jordan Sellers developed the initial training corpus of 19c documents categorized by genre. 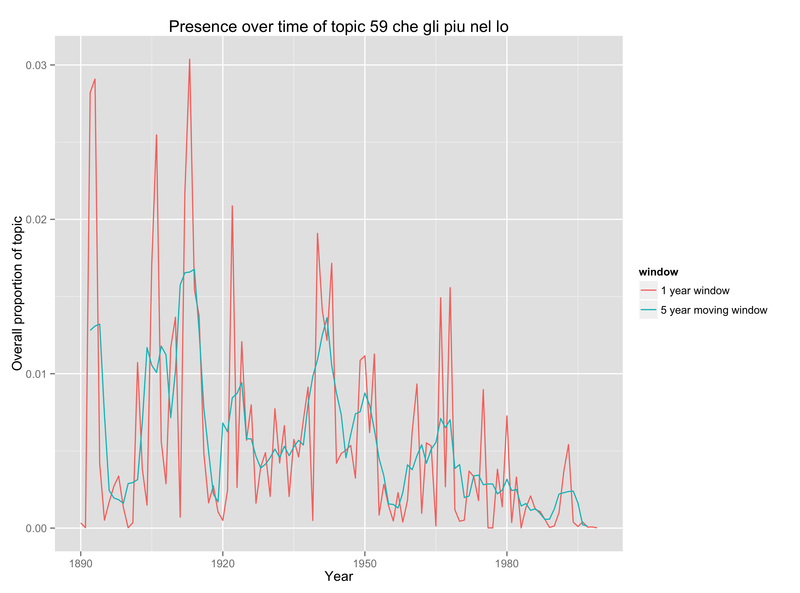 What can topic models of PMLA teach us about the history of literary scholarship? Of all our literary-historical narratives it is the history of criticism itself that seems most wedded to a stodgy history-of-ideas approach—narrating change through a succession of stars or contending schools. While scholars like John Guillory and Gerald Graff have produced subtler models of disciplinary history, we could still do more to complicate the narratives that organize our discipline’s understanding of itself. A browsable network based on Underwood's model of PMLA. Click through, then mouse over or click on individual topics. The archive of scholarship is also, unlike many twentieth-century archives, digitized and available for “distant reading.” Much of what we need is available through JSTOR’s Data for Research API. So last summer it occurred to a group of us that topic modeling PMLA might provide a new perspective on the history of literary studies. Although Goldstone and Underwood are writing this post, the impetus for the project also came from Natalia Cecire, Brian Croxall, and Roger Whitson, who may do deeper dives into specific aspects of this archive in the near future. Topic modeling is a technique that automatically identifies groups of words that tend to occur together in a large collection of documents. It was developed about a decade ago by David Blei among others. Underwood has a blog post explaining topic modeling, and you can find a practical introduction to the technique at the Programming Historian. Jonathan Goodwin has explained how it can be applied to the word-frequency data you get from JSTOR. Obviously, PMLA is not an adequate synecdoche for literary studies. But, as a generalist journal with a long history, it makes a useful test case to assess the value of topic modeling for a history of the discipline. Goldstone and Underwood each independently produced several different models of PMLA, using different software, stopword lists, and numbers of topics. Our results overlapped in places and diverged in places. But we’ve reached a shared sense that topic modeling can enrich the history of literary scholarship by revealing trends that are presently invisible. A “topic model” assigns every word in every document to one of a given number of topics. Every document is modeled as a mixture of topics in different proportions. A topic, in turn, is a distribution of words—a model of how likely given words are to co-occur in a document. The algorithm (called LDA) knows nothing “meta” about the articles (when they were published, say), and it knows nothing about the order of words in a given document. This is not a “topic” in the sense of a theme or a rhetorical convention. What these words have in common is simply that they’re basic Italian words, which appear together whenever an extended Italian text occurs. And this is the point: a “topic” is neither more nor less than a pattern of co-occurring words. What can topics tell us about the history of theory? Of course a topic can also be a subject category—modeling PMLA, we have found topics that are primarily “about Beowulf” or “about music.” Or a topic can be a group of words that tend to co-occur because they’re associated with a particular critical approach. Here, for instance, we have a topic from Underwood’s 150-topic model associated with discussions of pattern and structure in literature. We can characterize it by listing words that occur more commonly in the topic than elsewhere, or by graphing the frequency of the topic over time, or by listing a few articles where it’s especially salient. At first glance this topic might seem to fit neatly into a familiar story about critical history. We know that there was a mid-twentieth-century critical movement called “structuralism,” and the prominence of “structure” here might suggest that we’re looking at the rise and fall of that movement. In part, perhaps, we are. But the articles where this topic is most prominent are not specifically “structuralist.” In the top four articles, Ferdinand de Saussure, Claude Lévi-Strauss, and Northrop Frye are nowhere in evidence. Instead these articles appeal to general notions of symmetry, or connect literary patterns to Neoplatonism and Renaissance numerology. By forcing us to attend to concrete linguistic practice, topic modeling gives us a chance to bracket our received assumptions about the connections between concepts. While there is a distinct mid-century vogue for structure, it does not seem strongly associated with the concepts that are supposed to have motivated it (myth, kinship, language, archetype). And it begins in the 1940s, a decade or more before “structuralism” is supposed to have become widespread in literary studies. 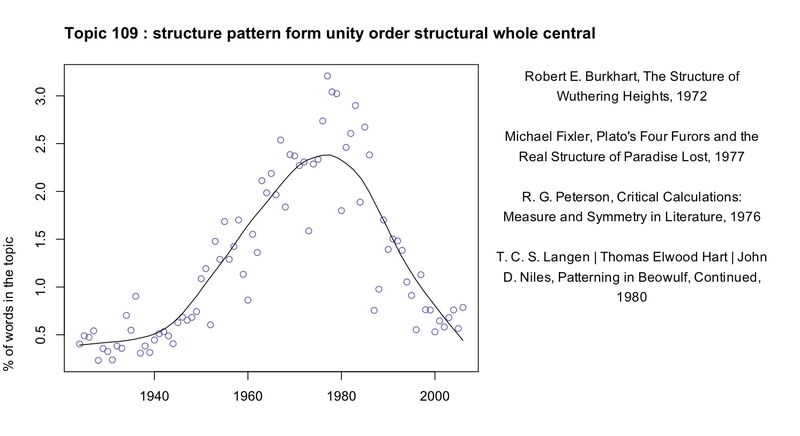 We might be tempted to characterize the earlier part of this trend as “New Critical interest in formal unity” and the latter part of it as “structuralism.” But the dividing line between those rationales for emphasizing pattern is not evident in critical vocabulary (at least not at this scale of analysis). This evidence doesn’t necessarily disprove theses about the history of structuralism. Topic modeling might not reveal varying “rationales” for using a word even if those rationales did vary. The strictly linguistic character of this technique is a limitation as well as a strength: it’s not designed to reveal motivation or conflict. But since our histories of criticism are already very intellectual and agonistic, foregrounding the conscious beliefs of contending critical “schools,” topic modeling may offer a useful corrective. This technique can reveal shifts of emphasis that are more gradual and less conscious than the ones we tend to celebrate. It may even reveal shifts of emphasis of which we were entirely unaware. “Structure” is a familiar critical theme, but what are we to make of this? A fuller list of terms included in this topic would include “character”, “fact,” “choice,” “effect,” and “conflict.” Reading some of the articles where the topic is prominent, it appears that in this topic “point” is rarely the sort of point one makes in an argument. Instead it’s a moment in a literary work (e.g., “at the point where the rain occurs,” in Robert apRoberts 379). 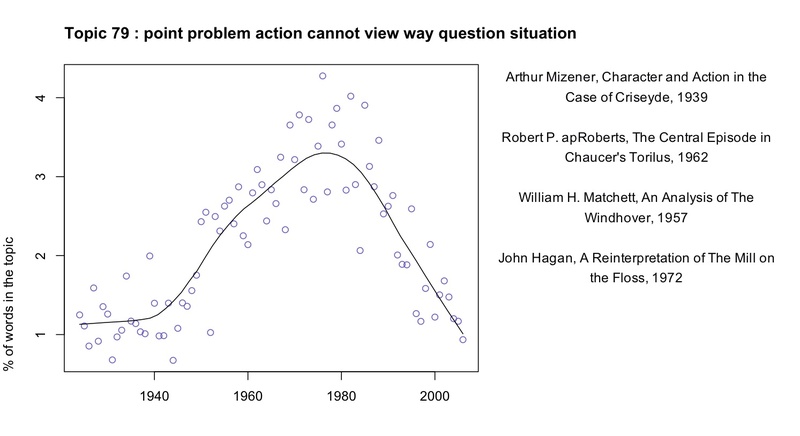 Apparently, critics in the 1960s developed a habit of describing literature in terms of problems, questions, and significant moments of action or choice; the habit intensified through the early 1980s and then declined. This habit may not have a name; it may not line up neatly with any recognizable school of thought. But it’s a fact about critical history worth knowing. We don’t imagine that this brief blog post has significantly contributed to the history of criticism. But we do want to suggest that topic modeling could be a useful resource for that project. It has the potential to reveal shifts in critical vocabulary that aren’t well described, and that don’t fit our received assumptions about the history of the discipline. Why browse topics as a network? The fact that a word is prominent in topic A doesn’t prevent it from also being prominent in topic B. So certain generalizations we might make about an individual topic (for instance, that Italian words decline in frequency after midcentury) will be true only if there’s not some other “Italian” topic out there, picking up where the first one left off. For that reason, interpreters really need to survey a topic model as a whole, instead of considering single topics in isolation. But how can you browse a whole topic model? We’ve chosen relatively small numbers of topics, but it would not be unreasonable to divide literary scholarship into, say, 500 topics. Information overload becomes a problem. A browsable image map of 150 topics from PMLA. After you click through you can mouseover (or click) individual topics for more information. We’ve found network graphs useful here. Click on the image of the network on the right to browse Underwood’s 150-topic model. The size of each node (roughly) indicates the number of words in the topic; color indicates the average date of words. (Blue topics are older; yellow topics are more recent.) Topics are linked to each other if they tend to appear in the same articles. Topics have been labeled with their most salient word—unless that word was already taken for another topic, or seemed misleading. Mousing over a topic reveals a list of words associated with it; with most topics it’s also possible to click through for more information. The structure of the network makes a loose kind of sense. Topics in French and German form separate networks floating free of the main English structure. Recent topics tend to cluster at the bottom of the page. 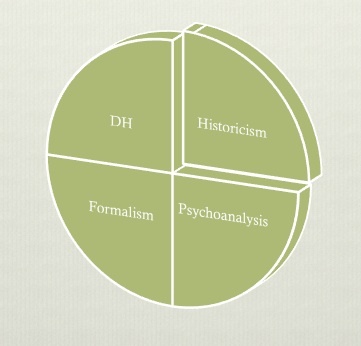 And at the bottom, historical and pedagogical topics tend to be on the left, while formal, phenomenological, and aesthetic categories tend to be on the right. But while it’s a little eerie to see patterns like this emerge automatically, we don’t advise readers to take the network structure too seriously. A topic model isn’t a network, and mapping one onto a network can be misleading. For instance, topics that are physically distant from each other in this visualization are not necessarily unrelated. Connections below a certain threshold go unrepresented. Goldstone’s 100-topic model of PMLA; click through to enlarge. Moreover, as you can see by comparing illustrations in this post, a little fiddling with dials can turn the same data into networks with rather different shapes. It’s probably best to view network visualization as a convenience. It may help readers browse a model by loosely organizing topics—but there can be other equally valid ways to organize the same material. How did our models differ? The two models we’ve examined so far in this post differ in several ways at once. They’re based on different spans of PMLA‘s print run (1890–1999 and 1924–2006). They were produced with different software. Perhaps most importantly, we chose different numbers of topics (100 and 150). But the models we’re presenting are only samples. Goldstone and Underwood each produced several models of PMLA, changing one variable at a time, and we have made some closer apples-to-apples comparisons. Broadly, the conclusion we’ve reached is that there’s both a great deal of fluidity and a great deal of consistency in this process. The algorithm has to estimate parameters that are impossible to calculate exactly. So the results you get will be slightly different every time. If you run the algorithm on the same corpus with the same number of topics, the changes tend to be fairly minor. But if you change the number of topics, you can get results that look substantially different. This version of the topic is no less “right” or “wrong” than the one in Underwood’s model. They both reveal the same underlying evidence of word use, segmented in different but overlapping ways. Instead of focusing our vision on affinities between “form” and “structure”, Goldstone’s 100-topic model shows a broader connection between the critical vocabulary of form and structure and the keywords of “humanistic” reflection on experience. Underwood’s model shows a similar cluster of topics centering on questions of evidence and textual documentation, which similarly decrease in frequency. The language of PMLA has shown a consistently declining interest in “evidence found fact” in the era of the postwar research university. So any given topic model of a corpus is not definitive. Each variation in the modeling parameters can produce a new model. But although topic models vary, models of the same corpus remain fundamentally consistent with each other. It’s true that a “topic model” is simply a model of how often words occur together in a corpus. But information of that kind has a deeper significance than we might at first assume. A topic model doesn’t just show you what people are writing about (a list of “topics” in our ordinary sense of the word). It can also show you how they’re writing. And that “how” seems to us a strong clue to social affinities—perhaps especially for scholars, who often identify with a methodology or critical vocabulary. To put this another way, topic modeling can identify discourses as well as subject categories and embedded languages. Naturally we also need other kinds of evidence to produce a history of the discipline, including social and institutional evidence that may not be fully manifest in discourse. But the evidence of topic modeling should be taken seriously. As you change the number of topics (and other parameters), models provide different pictures of the same underlying collection. But this doesn’t mean that topic modeling is an indeterminate process, unreliable as evidence. All of those pictures will be valid. They are taken (so to speak) at different distances, and with different levels of granularity. But they’re all pictures of the same evidence and are by definition compatible. Different models may support different interpretations of the evidence, but not interpretations that absolutely conflict. Instead the multiplicity of models presents us with a familiar choice between “lumping” or “splitting” cultural phenomena—a choice where we have long known that multiple levels of analysis can coexist. This multiplicity of perspective should be understood as a strength rather than a limitation of the technique; it is part of the reason why an analysis using topic modeling can afford a richly detailed picture of an archive like PMLA. Appendix: How did we actually do this? The PMLA data obtained from JSTOR was independently processed by Goldstone and Underwood for their different LDA tools. This created some quantitative subtleties that we’ve saved for this appendix to keep this post accessible to a broad audience. If you read closely, you’ll notice that we sometimes talk about the “probability” of a term in a topic, and sometimes about its “salience.” Goldstone used MALLET for topic modeling, whereas Underwood used his own Java implementation of LDA. As a result, we also used slightly different formulas for ranking words within a topic. MALLET reports the raw probability of terms in each topic, whereas Underwood’s code uses a slightly more complex formula for term salience drawn from Blei & Lafferty (2009). In practice, this did not make a huge difference. MALLET also has a “hyperparameter optimization” option which Goldstone’s 100-topic model above made use of. Before you run screaming, “hyperparameters” are just dials that control how much fuzziness is allowed in a topic’s distribution across words (beta) or across documents (alpha). Allowing alpha to vary allows greater differentiation between the sizes of large topics (often with common words), and smaller (often more specialized) topics. (See “Why Priors Matter,” Wallach, Mimno, and McCallum, 2009.) In any event, Goldstone’s 100-topic model used hyperparameter optimization; Underwood’s 150-topic model did not. A comparison with several other models suggests that the difference between symmetric and asymmetric (optimized) alpha parameters explains much of the difference between their structures when visualized as networks. Goldstone’s processing scripts are online in a github repository. 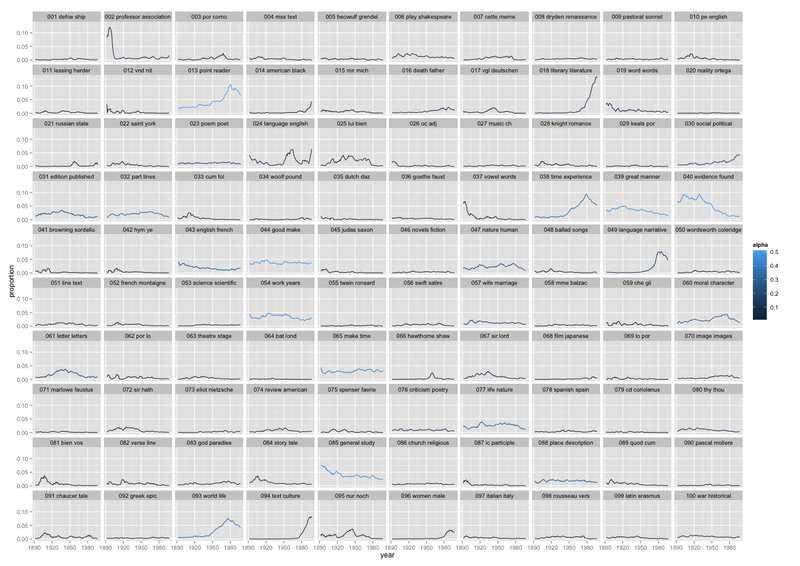 The same repository includes R code for making the plots from Goldstone’s model. Goldstone would also like to thank Bob Gerdes of Rutgers’s Office of Instructional and Research Technology for support for running mallet on the university’s apps.rutgers.edu server, Ben Schmidt for helpful comments at a THATCamp Theory session, and Jon Goodwin for discussion and his excellent blog posts on topic-modeling jstor data. Underwood’s network graphs were produced by measuring Pearson correlations between topic distributions (across documents) and then selecting the strongest correlations as network edges using an algorithm Underwood has described previously. That data structure was sent to Gephi. Underwood’s Java implementation of LDA, as well as his PMLA model, and code for translating a model into a network, are on github, although at this point he can’t promise a plug-and-play workflow. Underwood would like to thank Matt Jockers for convincing him to try topic modeling (see Matt’s impressive, detailed model of the nineteenth-century novel) and Michael Simeone for convincing him to try force-directed network graphs. David Mimno kindly answered some questions about the innards of MALLET. Force-directed graphs are tricky. At their best, the perspective they offer can be very helpful; data points cluster into formations that feel intuitive and look approachable. At their worst, though, they can be too cluttered, and the algorithms that make everything fall into place can deceive as much as they clarify. But there’s still a good chance that, despite the problems that come along with making a network model of anything (and the problems introduced by making network models of texts), they can still be helpful for interpreting topic models. Visualizations aren’t exactly analysis, so what I share below is meant to raise more questions than answers. We also tried to represent as many aspects of the data as possible without breaking (or breaking only a little) the readability of the visualizations. There were some very unsuccessful tries before we arrived at what is below. As part of our work together, Ted has run some topic models on his 19th century literature dataset and computed the correlation of each topic to other topics. We decided to try this out to see topic distribution among genres, and to get a feel for how topics clustered with one another. Which documents belong to what topic aren’t important for now, although in time I’d like to have the nodes link to the text of the documents. Ted has also calculated the predominant genre to which each topic belongs. And, after building a network model where topic correlation equals edge value, I’ve run the Girvan-Newman algorithm to assess how the topics would cluster by their associations with other topics (I like this approach to grouping better than others for examinations of overall graph structure like this one, as we’re not as interested in individual cliques or clusters). What we get then, is two different ways to categorize the topic: on the one hand we have the genre the topic appears in most (with the genres being assigned to individual documents by a human expert), and on the other we see groupings based on co-occurence with other topics. D3 allows this is to be an interactive visual, and mousing over an individual node will reveal the first ten words of the topic it represents. Also, clicking on a node allows for pulling and rearranging the graph. Doing this a few times helps reinforce the idea that distance between nodes is the result of a set of simulated physical properties. The colors assigned to the Newman groups are arbitrary, but there’s a key on the left to help distinguish among similar colors. Like the first graph, Newman color assignments are arbitrary; what’s purple in the first 50 years of topics has nothing to do with what’s purple in the next 50 years of topics. I’ve modified these graphs in two key ways to help with reading them. Firstly, bond thickness now variable, and it is a function of bond strength (bond strength derived from correlation). This helps assess if a bond is longer because it’s being stretched or because it’s weak, or both. Secondly, I’ve added node “halos” to emphasize the degree to which the nodes cluster, as well as highlight the Newman groups. I won’t pretend that any of these are easy to read immediately, but one of our experiments in this was to try to represent as many dimensions as possible to create an exploratory framework for a topic model. Halo and node diameter are set, but the two elements on the visualization are independent and could represent topic size, degree of genre predominance in a topic, etc. My hope is that these visualizations can be insightful and might help us work through the benefits and disadvantages of force-directed layouts for visualizing topic models.